Following the Pitt Report the Energy Networks Association produced a report covering the resilience to flooding of substations. One of the solutions to the issue of substation flooding in this report was preventing "groundwater seepage through ducts”. 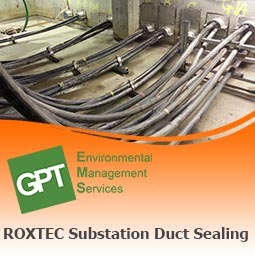 GPT have developed expertise in sealing cable entries into substations and since 2011 we have performed duct sealing works on over 100 substations leaving them safe from water ingress via their cable ducts and protecting the public from blackouts. Protecting substations from flooding also reduces humidity levels within substation buildings. High humidity can cause partial discharge and switchgear to malfunction; therefore preventing moisture from entering the substation is a high priority for DNO’s. We can utilise a range of technologies to seal ducts into substations depending on site specific conditions/requirements. We have a mechanical system ROXTEC and a mastic type sealant CSD RISE (for more information on the systems see the individual pages). We have vast experience in providing these applications to a variety of Utility companies in difficult environments such as confined spaces or where there is running water entering the substation. 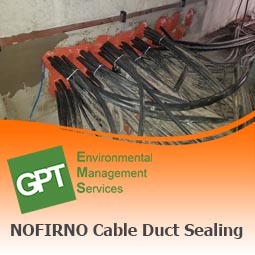 We also specialise in sealing ducts where current seals have failed or the ducts have been installed with no forethought to the requirement for duct sealing. For more information see the sealing failed cable entries page. *All work is quality checked and scored on the basis of the work. A perfect seal cannot always be guaranteed. "If possible design and construct ducts and chambers that prevent the ingress of water."